Breaking the Silence is a six-week study designed for existing Sunday school classes and study groups. The core conviction is simple: what was good news for Jesus should be good news for the church. Although Breaking the Silence can be taught in any Christian setting, it is specifically designed with “messy middle” congregations in mind. In America, messy middle congregations are found at the progressive end of the evangelical spectrum and in the churches of the Protestant mainline. As a rule, these churches are no longer inspired by the old-time gospel of revivalism, but they aren’t sure what to put in its place. There is little consensus within messy middle congregations about the content of the Christian gospel or how our shared faith should impact public policy. We don’t want to sound like religious fanatics and, since our congregations reflect the full range of political opinion, we avoid ideological conflict. America is in the early phase of a cultural revolution that will gradually push organized religion to the margins of social life. Churches that once enjoyed a seat at the table are losing their influence in an increasingly multicultural and “postmodern” society. This trend is particularly evident among Millennials, a generation that is far less enamored of organized religion than were their parents and grandparents. The brand of Christianity young people know best (the kind they see on television and on Facebook) is widely derided as narrow, intolerant and judgmental. Here’s the problem: the old time religion no longer resonates but messy middle churches have nothing concrete to offer in its place. Breaking the Silence is not a market-friendly version of Christianity-lite tailored to the tastes of postmodern America; the study simply asks what Jesus meant when he preached the gospel or “good news” and asks why we have a hard time taking him at his word. What was good news for Jesus, the study suggests, should be good news for the people who follow Jesus. 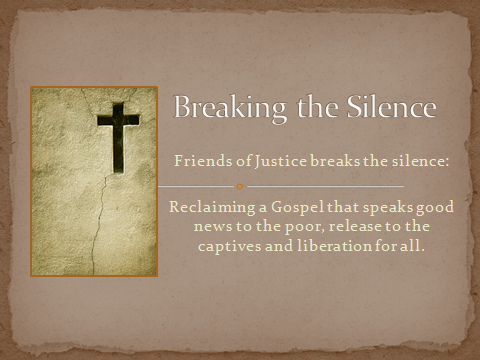 COURSE OUTLINE Lesson One: Silencing Jesus: Why is it so hard for the Church to follow Jesus? Central Idea: When Christianity is embraced by political power the message of Jesus becomes impossible. 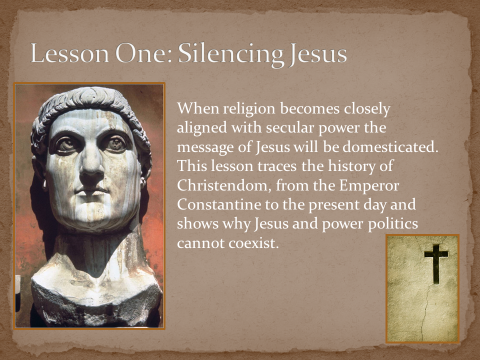 Lesson One traces the history of Christendom from the Emperor Constantine to the present, demonstrating why Jesus and secular power don’t mix. The church’s support for a tragically unjust drug bust in Tulia, Texas serves as a contemporary illustration of the problem. Lesson Two: Who is Jesus? 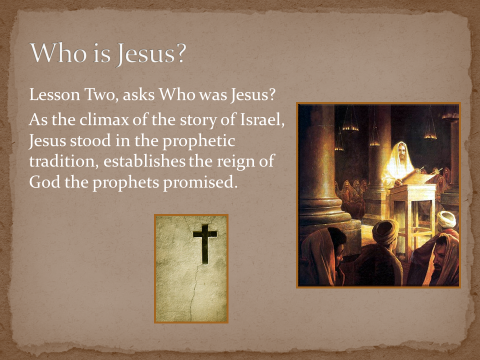 Central Idea: As the climax of the story of Israel, Jesus stood in the prophetic tradition, inaugurating the reign of God the prophets had long promised. Lesson Two suggests that Jesus learned the Hebrew scriptures in Nazareth’s synagogue. Gradually, Jesus came to see himself as the promised Messiah tasked with bringing the story of God’s people to a climax. Following Isaiah 53 and the experience of Israel’s prophets, Jesus saw himself as a Suffering Servant who would ultimately be rejected by his people. Jesus proclaimed the arrival of a kingdom that diverged sharply from both common messianic expectation and the harsh reality of Imperial Rome. According to the teacher from Nazareth, nothing short of kingdom-love, a love embracing the entirety of God’s creation, could save God’s people from imminent destruction. 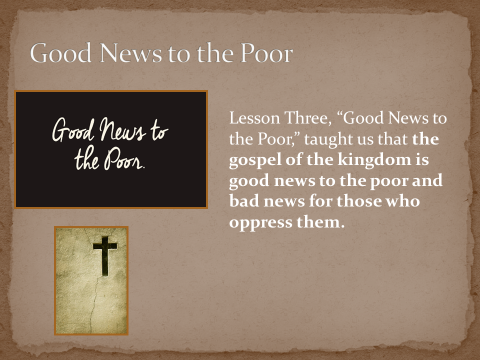 Central Idea: The gospel of the kingdom is good news to the poor and bad news to oppressors. Jesus believed that kingdom-love embraces the poor, the oppressed and the outcast. In this vertical dimension of the gospel, the established hierarchy (the powerful and entitled at the top and the poor at the bottom) is reversed. The last are first, the first are last and the kingdoms of this world are confronted by God’s kingdom. Central Idea: Because the kingdom of God abolishes us-them categories, Jesus-followers have no enemies and refuse to be treated as enemies. Jesus was almost killed by the hometown crowd at Nazareth for announcing that God’s kingdom is for everyone, Jew and Gentile alike. The church of Jesus Christ is counterculture that transcending differences of race, gender, social class, theology, ideology and political affiliation “for all are one in Christ Jesus”. This is the horizontal dimension of the gospel Jesus preached. 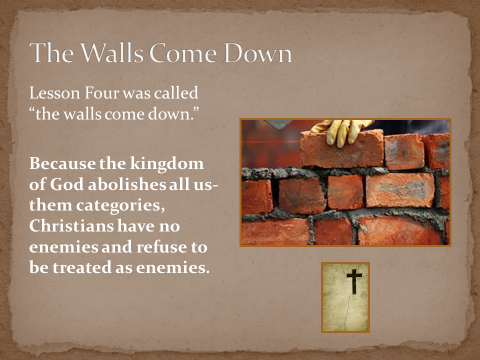 When the kingdom arrives, the walls come down. 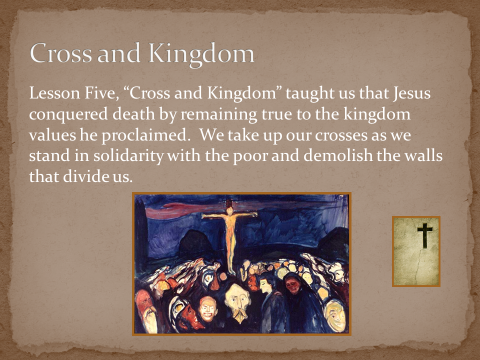 Lesson Five: Cross and Kingdom Central Idea: Jesus conquered death by remaining true to the kingdom values he proclaimed. We take up our crosses as, with Jesus, we stand in solidarity with the poor and demolish the walls that divide the human family. The vertical and horizontal dimensions of the kingdom Jesus preached, taken together, form a cross. Jesus defeated the “principalities and powers” aligned against God’s kingdom by living, and dying, as if God’s reign was a present reality. We participate in this great salvation by following our Master’s example. 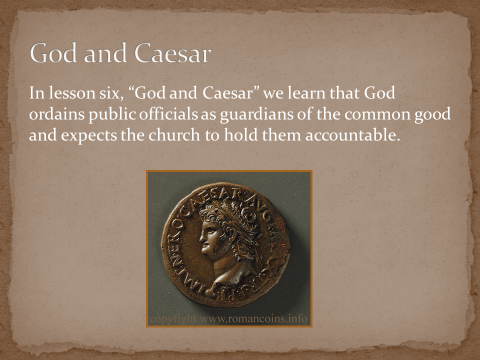 Central idea: God ordains public officials as guardians of the common good and expects the church to hold them accountable. When the message of Jesus is viewed against the backdrop of first century politics, the revolutionary implications of the gospel stand out in sharp relief. Secular leaders are called to serve as custodians of the common good but they easily forget and resist this calling. In the process, they fall under the influence of demonic, anti-kingdom forces. The church’s task is to remind secular leaders of their true calling. Unavoidably, this prophetic mission requires that we know what the common good looks like when viewed through the eyes of the poor. Dr. Alan Bean, Executive Director of Friends of Justice, is currently writing a book that will present the message of Breaking the Silence in the context of his justice work. When available, the book will greatly expand the reach of the program. If you would like to bring Breaking the Silence to your church or small group please contact Dr. Bean.